In a small bowl whisk together the pumpkin pie filling, egg yolk and pumpkin pie spice. Unroll Crescent dough and place 1 heaping tablespoon of filling on each one. Roll up each triangle, starting with the long end. Pinch sides to seal in filling. Place on a lightly-greased temp-tations 13x9 Lid-It. Continue until all of the dough is gone. Bake for 12 minutes or until golden brown. Set aside to cool. For the glaze, whisk together the powdered sugar, maple syrup, milk, cinnamon and nutmeg in a medium bowl. 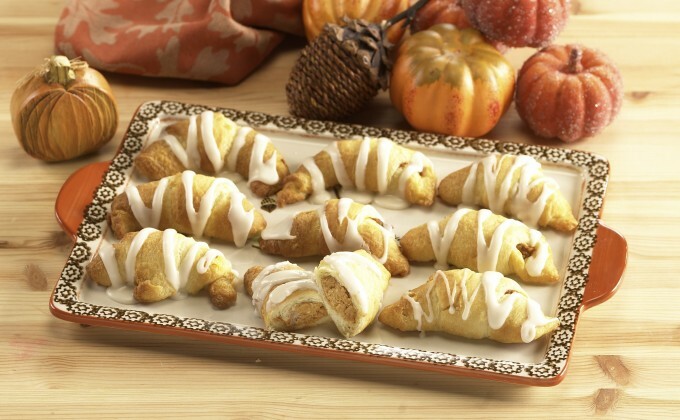 Using a spoon or piping bag, drizzle glaze all over the tops of the cooled Crescents. Serve immediately.